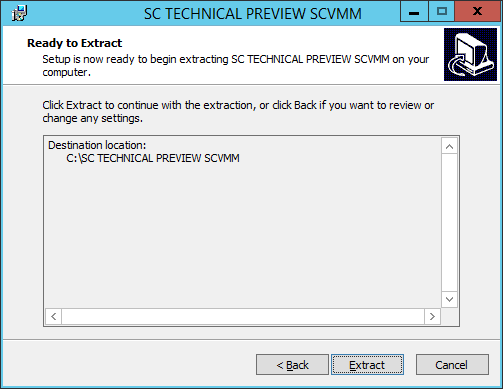 Start by copying the EXE file into the SCVMM VM. 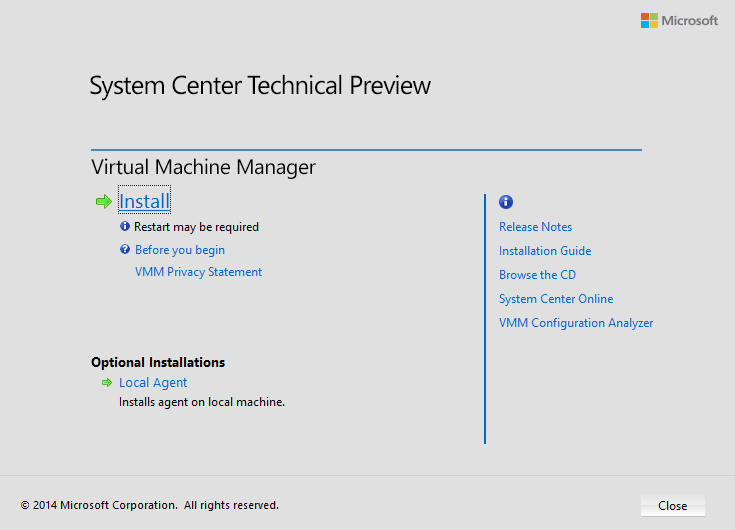 As of this writing, the Technical Preview EXE is labelled as “en_system_center_technical_preview_virtual_machine_manager_x86_x64_5648854.exe“. On the Select Features screen, select the feature you want to install. In our example, we are installing all features on the same server, so we will select all of them and click Next. 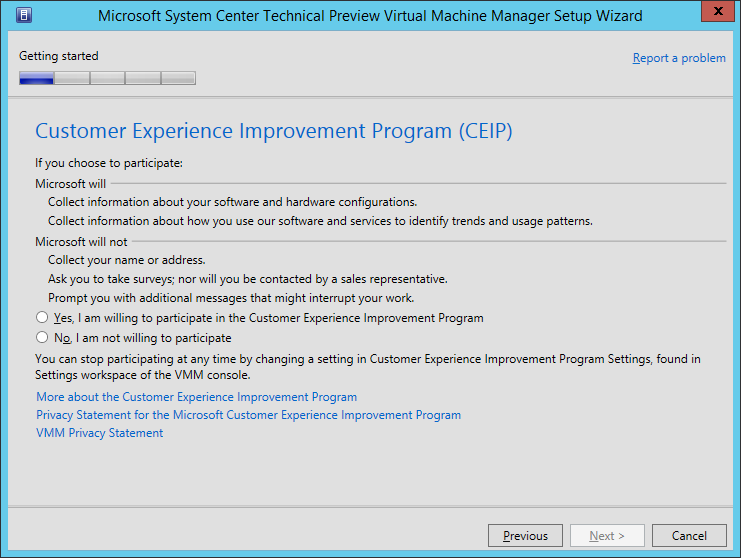 You may notice that there is no Reporting option in comparison to other System Center product installations. 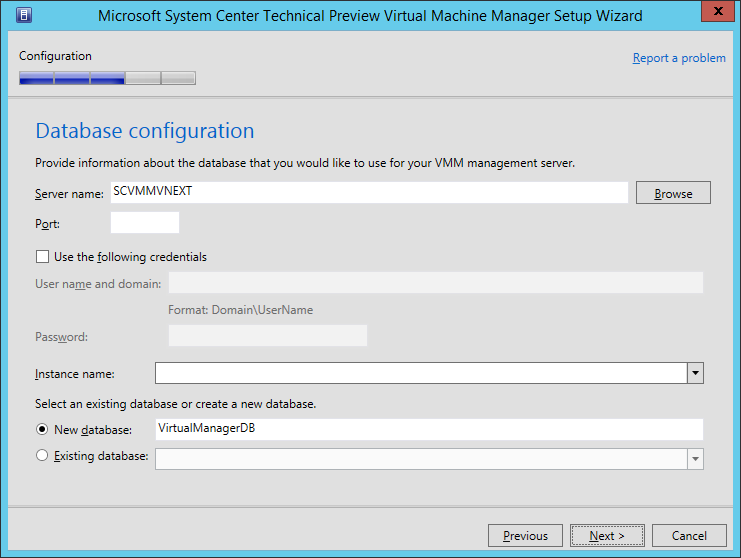 This is because the reporting for SCVMM is actually integrated into the reporting feature of System Center Operations Manager (SCOM). 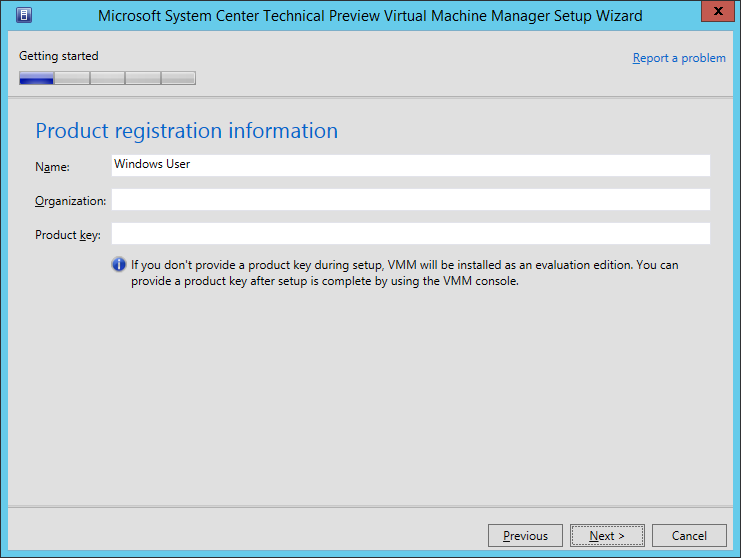 If you are performing this installation in Production, you may want to provide Registration information for your organization along with a valid Product Key. Since this example is in a lab, I am not providing any information. Make applicable entries, and then click Next. 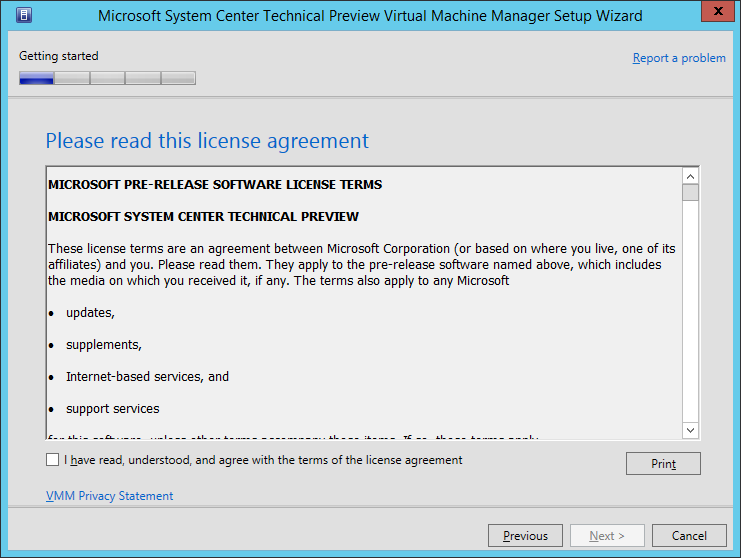 Next read the License Agreement, check the applicable checkbox, and then click Next. Now you can choose if you want to be a part of the CEIP program. Make an applicable choice and then click Next. 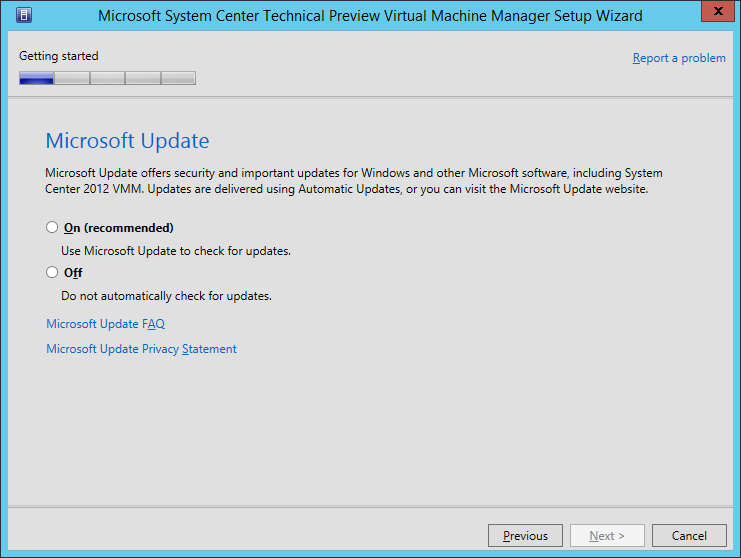 You can choose if you want to find updates for the product by using Microsoft Updates. 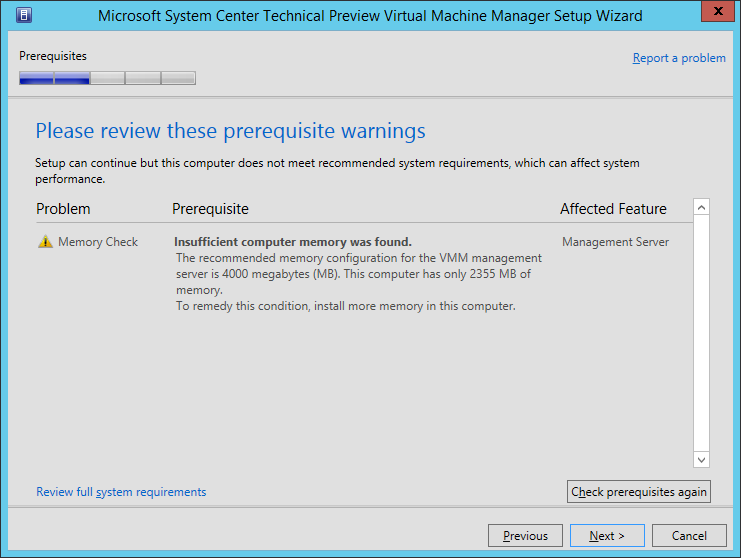 Depending on your patching/upgrading policies/procedures, make an appropriate choice and then click Next. Next you need to provide an Installation Location. Ensure there is sufficient space and then click Next. The Prerequisites will be checked. Once you meet all the prereqs, you can continue. You will now be asked to supply the Database Configuration information. Enter the applicable information for your environment and then click Next. 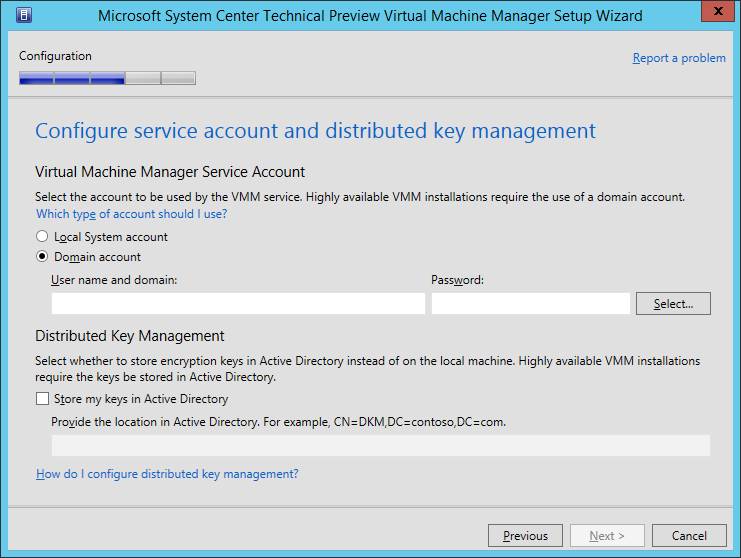 On this next screen you can specify the Service Account to use, and if you want to use Active Directory for your encryption keys. In a Production environment, this would be more applicable, but for our lab it doesn’t matter. If you want to walk through the process/uses of this, then choose to enable the option and then click Next. 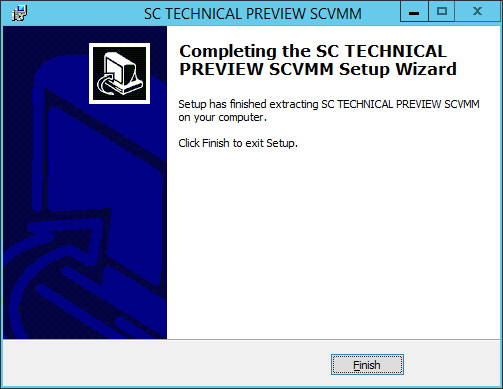 On the Port Configuration screen, you can change the ports that SCVMM uses. Depending on your environment, you may have to make some modifications, but for our lab example, we will use the defaults. 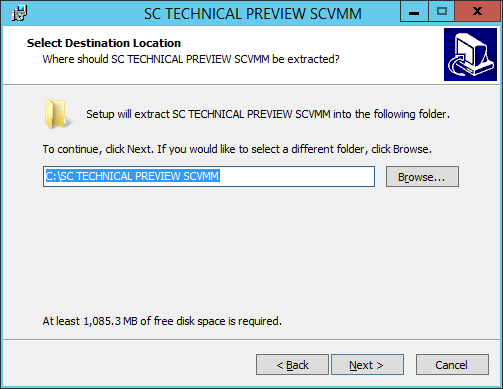 Next you need to specify the location for the SCVMM Library. This is the location that will contain all of your ISO’s, VHDs, etc. Be sure to provide sufficient space. 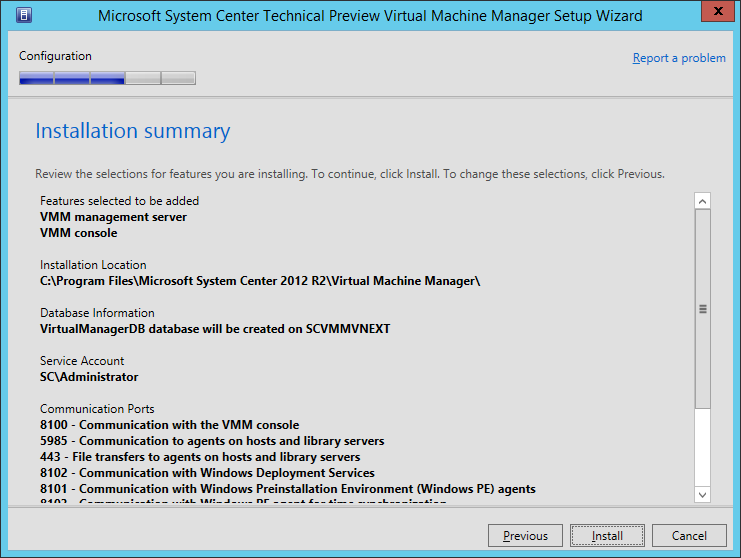 Microsoft recommends 150 GB if you’re running a local version of SQL. 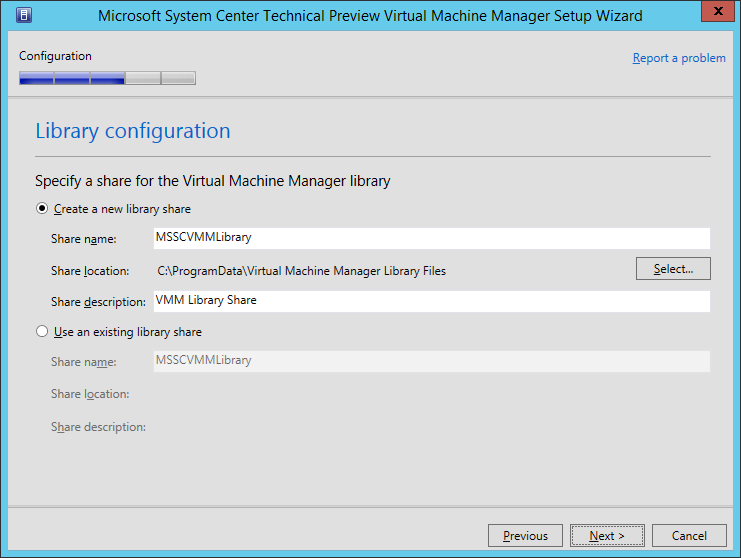 In my lab example, since I am running out of space on my SSD drive, I opted to create a second VHD drive attached to the VM strictly for installing SCVMM, SQL, and the Library Share. Setup your environment accordingly, and click Next. The installation may take some time, so be patient. Once it is complete, you can choose to check for the latest updates and open the console if you wish. Click Close. 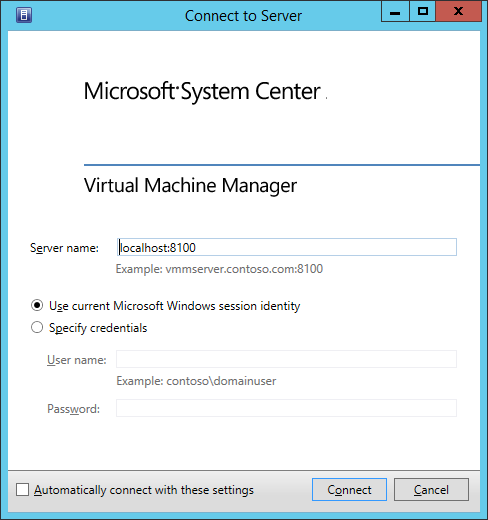 When SCVMM launches for the first time, you will have to provide a server name to connect to. You can choose to check off the ‘Automatically connect with these settings’ checkbox so that you don’t have to continue to enter the server name. Enter your server information and click Connect. 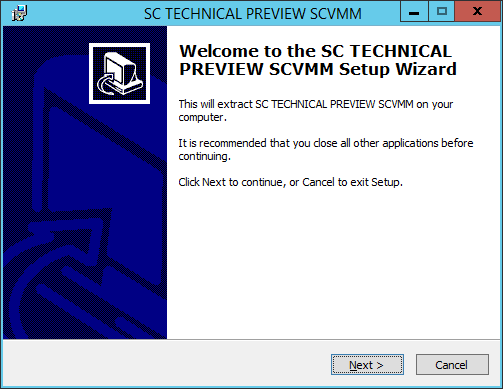 The SCVMM console will launch. Navigate around the various areas. 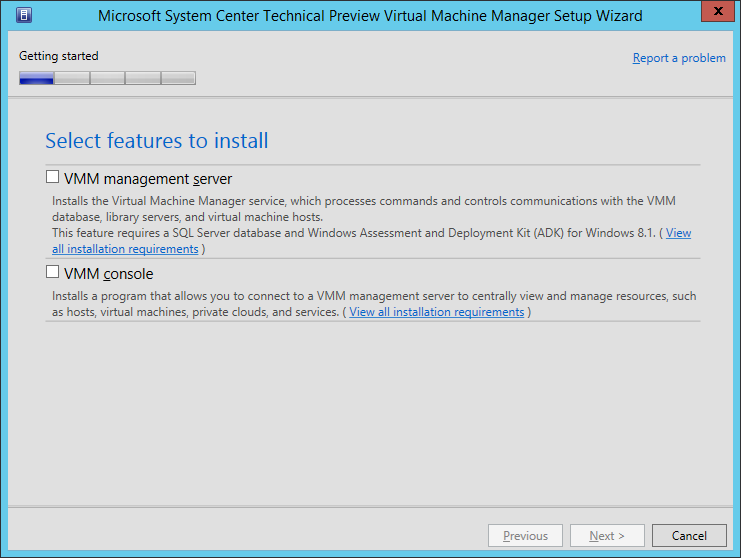 Congratulations, you have now successfully installed the System Center Virtual Machine Manager Technical Preview. 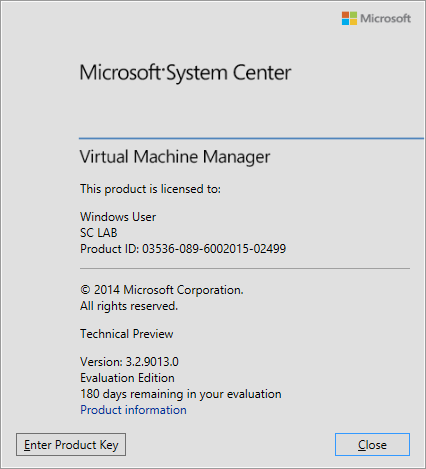 As you can see from the About screen, the version of SCVMM, even though it shows “System Center 2012 R2”, the version is: 3.2.9013.0 (whereas the actual 2012 R2 product is version 3.2.7672.0). 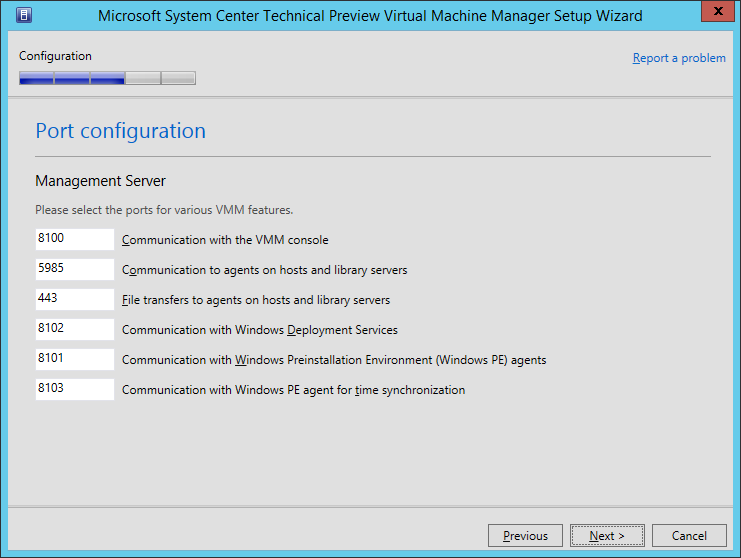 Replacement: For on-premises deployments, provision IaaS and PaaS solutions using Windows Azure Pack. 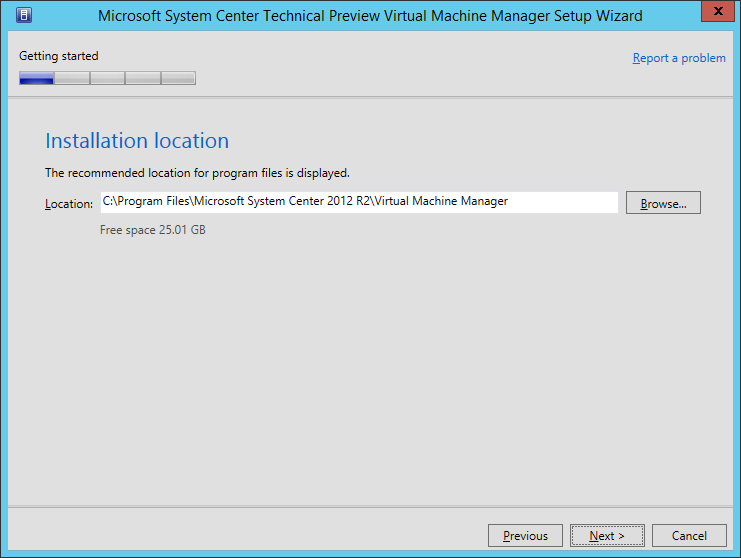 Additionally, virtual machine and PaaS self-service solutions are available in Windows Azure Pack and Azure. 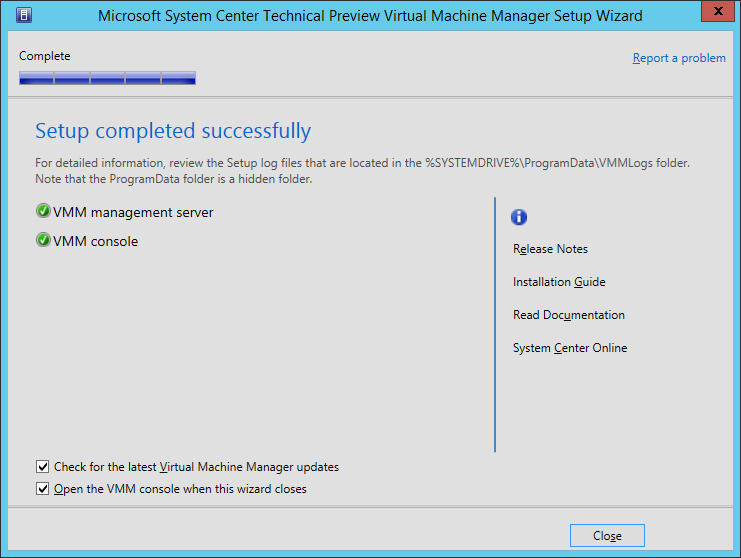 Replacement: Use VMWare vCenter 5.5 and 5.8.